These days, a New York City Ballet premiere by Justin Peck is big news, and Rodeo: Four Dance Episodes (sans the editor's nightmare of diacriticals) certainly adds to his rapidly growing stock of lively, thrilling ballets. Also of interest is the dance's context; it followed Ratmansky's recent Pictures at an Exhibition, and preceded Wheeldon's Mercurial Manoeuvres. There are links and degrees of influence among these guys, who are among the top ballet choreographers in demand. This new four-section work to Copland's score contains broad themes of energy, weather, and nature. Peck breaks the fourth wall, like Ratmansky often has, most notably in Namouna. In Rodeo, which comprises 15 men and Tiler Peck, some of the men sit on the stage's edge, feet dangling over the orchestra pit, or reach toward the audience like the ham-handed effects in a 3D movie. They break poses and relax midstage as if in rehearsal, lost in thought. It's a device that invites us into their lofty realm, parlayed into a sublime heaven-on-earth by Brandon Stirling Baker's warm-hued lighting that evokes the smell of toast and hot chocolate, and shows us how spacious the Koch stage is. 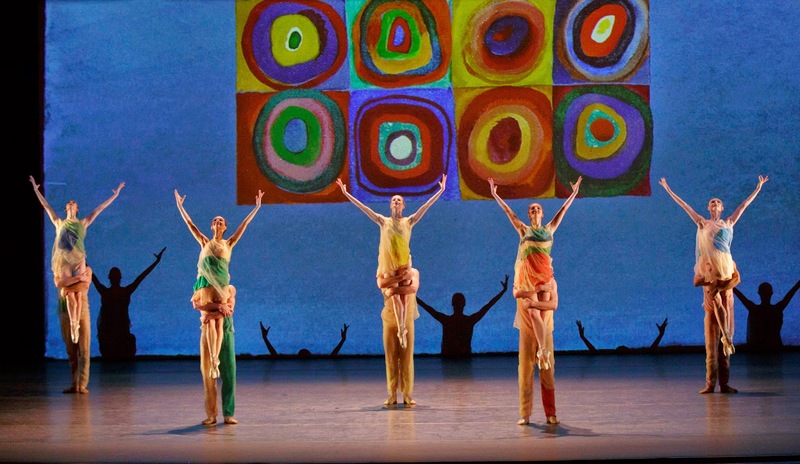 The dance's sporty mood, set by athletic wear costumes by Reid Bartelme, Harriet Jung, and Peck, begins with the line of men "in the blocks" at the left, who then sprint across the stage. Daniel Ulbricht does what he does, which is spin, leap, and fly. The group of men fracture into small groups, supporting one in suspended or poses, or lifting one like a slow-motion carousel pony. Tiler Peck and Amar Ramasar, in an extended duet, move eloquently, unfurling into striking poses, including a lift in which Peck vamps like a bathing suit model, flaunting her bare legs. Ramasar bends down to pull a cord, like starting a lawn mower, as the percussionist makes a similar noise. Gonzalo Garcia—like Ulbricht, an underutilized principal—is featured in the fourth movement. The group huddles and blossoms opens to reveal a soloist, like unwrapping a present. The eye is constantly fed, and there's plenty left to see in repeated viewings. There's a collegiality in Peck's dances that can only be enhanced by his position as a dancer. The new film Ballet 422, by Jody Lee Lipes, focuses on Peck's creation of another NYCB commission, Paz de la Jolla. Free of talking heads, it trails Peck as a dancer—in class, putting on makeup, backstage pre-show; and as a choreographer—in the studio alone with only his iPhone to record his own movement experiments, with Tiler Peck and Ramasar, in meetings with the lighting and costume designers, working at home. It is remarkable how self-possessed and focused he is for a 25-year-old (it was largely shot three years ago). Seeing the premiere of Rodeo just after watching Ballet 422 only multiplies the amount of respect I have for this young artist, who has already contributed some major ballets to the company's rich holdings. New to roles—Pictures: Georgina Pascoguin (Sara Mearns' role), extraordinarily dramatic and risk-taking; wonderful to see this veteran soloist in featured roles which show her full dancing potential (we already know she's a fantastic dramatic artist). Sterling Hyltin (Wendy Whelan's role) conveys a similar clarity and deftness to Whelan, but has yet to gain the depth that may simply come with experience. Mercurial—the apprentice Preston Chambliss, with endless legs and ballon, a gifted young dancer in a state of emergence. Russell Janzen, a new soloist, partnering Sara Mearns; they are wonderfully proportioned together, and his coolness complements her fire.